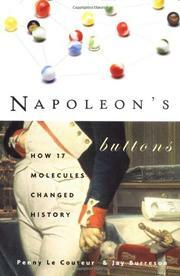 Two scientists entertainingly explore the intersections between chemistry and history, such as the French army uniform buttons made of tin, which crumbles to dust in low temperatures, that some scholars blame for the failure of Napoleon’s Russian campaign. In their very brief introduction, Le Couteur (Chemsitry/Capilano College, British Columbia) and industrial chemist Burreson outline the basics of molecular structures, emphasizing how much difference even an apparently tiny alteration can make. The bulk of the text consists of 17 chapters devoted to individual molecules or related groups of molecules, natural as well as synthetic, covering almost every area of human activity. Peppers, nutmeg, and cloves set off a wave of explorations and conquests beginning in the late Middle Ages and ending with European colonies around the globe. The discovery of ascorbic acid, better known as vitamin C, made possible the long voyages that solidified the colonial powers’ grip on their empires. Nitro compounds, in particular gunpowder and other explosives, are key ingredients in the change from the stylized combat of medieval warfare to the bombs and rockets of today. Other chemicals made their impact closer to home: mauve, the synthetic dye that named a decade; and nylon, which changed the face of women's fashions. The addictive chemicals nicotine, morphine, and caffeine have played sinister roles in the oppression of native peoples in several parts of the world, but so have cellulose and sucrose, the central molecules of cotton and sugar. Many chemical substances have had ambiguous histories; the insecticide DDT, now outlawed in much of the world, contributed greatly to the virtual disappearance of mosquito-borne diseases such as malaria from developed countries. The authors unearth a wealth of anecdotes from all parts of the world and use them effectively to illustrate the technological underpinnings of modern society. Thoughtful, often surprising, smoothly written.